I was pleased to be invited to summarise the state of health in East Kent for the website of Labour in the South East Region. Campaigners across Thanet have been working hard to try and protect health services from Government cuts, and we are proud that the Shadow Secretary of State for Health and Social Care, Jonathan Ashworth, supports us in this struggle. The full article is here and reproduced below. Our proudest achievement – the National Health Service – is being decimated in England. Nowhere is this more apparent than in East Kent. Health commissioners for Kent and Medway have decided that our six existing stroke units aren’t good enough and need to be upgraded into “hyper acute stroke units” (HASUs). The problem is that they plan to upgrade only three of the six units and close the other three down. Thanet is the poorest part of East Kent, according to every known index, and it suffers some of the worst health in the country, including a high rate of strokes. You’d have thought, then, that Thanet might be considered as a site for one of the new HASUs. But when the official consultation over the future of stroke services in Kent and Medway began and five options were drawn up for hospitals that might receive a new hyper-acute stroke unit, Thanet’s hospital, Queen Elizabeth the Queen Mother (QEQM), wasn’t even mentioned. Campaigners from Save Our NHS in Kent (SONiK), of which I’m a member, have petitioned health commissioners to include QEQM as an option, collecting thousands of signatures in the process. We’ve organised street stalls, protests outside the hospital and a symbolic march from the hospital to our biggest shopping complex on a busy Saturday afternoon. But, despite the huge public outcry, health commissioners have made clear their preference, and the people of Thanet have been left out in the cold. The people of Medway, too, face a future without their stroke unit – another striking injustice. When the Government devolved control of the component parts of NHS England to clinical commissioners in 2012, it gave them a statutory duty to tackle health inequalities by ensuring that those most in need could access the relevant services. The latest decision by Kent and Medway’s health commissioners flies in the face of that duty. SONiK is urging everyone to sign a petition, calling on East Kent’s health boss to think again, and to join us in protest outside QEQM hospital at 12 noon on Saturday 6 October. In east Kent, we face other problems, too. All three of our main hospitals have been placed in special measures. Just last month, we heard that QEQM is failing to see one in five patients at accident and emergency within the four-hour limit set by Government. There are plans to transfer staff employed by the hospital trust – which owns QEQM, Kent and Canterbury Hospital and William Harvey Hospital – to a “wholly owned subsidiary company” called 2together Support Solutions. Hospitals trusts claim this move will save them money by exploiting a tax loophole, but the major savings will come from employing new staff on non-NHS terms and conditions and with no access to the NHS Pension Scheme. It’s a form of backdoor privatisation – bad news for staff and for our NHS. In protest, Unite called a strike from 24 to 28 September. Many Unite and Labour Party members joined staff on the picket lines. 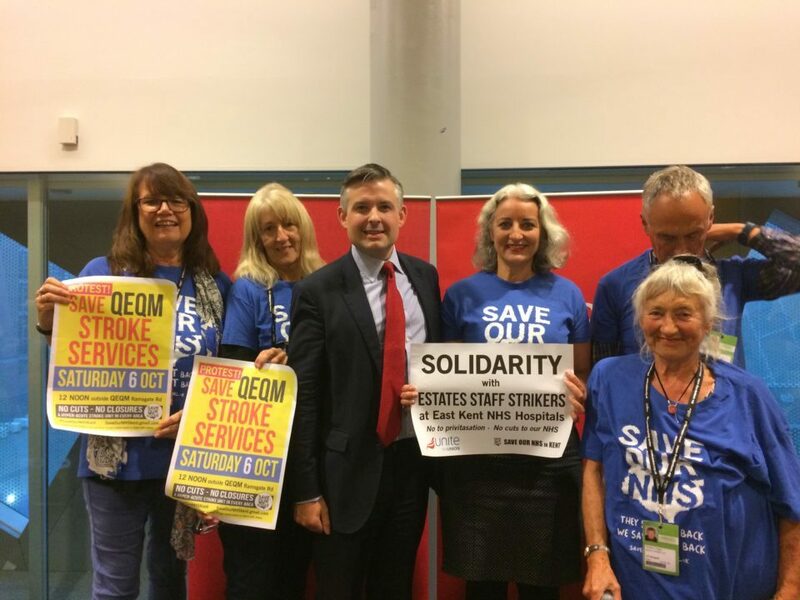 At the Labour Party’s annual conference, SONiK campaigners were delighted when the Shadow Secretary of State for Health and Social Care, Jonathan Ashworth, had his photograph taken with us, in support of East Kent hospitals’ facilities and staff. Labour MPs will continue to fight for our health services, and a future Labour Government will restore decisions about the NHS to the Department of Health – a crucial move which will bring an end to vested interests determining the future of our health. Both locally and nationally, the battle for our NHS is the greatest battle we can fight. We have to win it.